A TV personality who travels the world visiting bars and pubs is bringing his “Sing the Booze Tour” to Iowa. Zane Lamprey’s job basically involves learning local drinking customs and sampling all kinds of beer, wine and liquor. And he’s not complaining. “I get paid to do what most people consider a leisure time activity…going to a different country or state and trying different beers, alcohols and cocktails, meeting people and just hanging out and having a good time. I mean, that’s my job,” Lamprey told Radio Iowa. 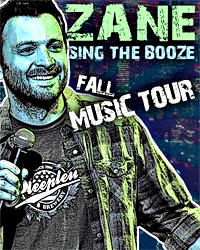 The host of “Drinking Made Easy” (HD-Net) and “Three Sheets” (Travel Channel) is now on a 27-city U.S. tour with a backing band and his buddy Steve McKenna. Lamprey describes the show as a mix of music, comedy and — surprise — a drinking game. “It all surrounds having a good time and it’s more of an engaged experience for the audience,” Lamprey said. “It involves telling stories of some of our travels, mixed in with some songs, mixed in with the show being a drinking game. It’s really like a performance as opposed to a stand-up comedy show.” Lamprey’s tour stops in Council Bluffs tonight at the Horseshoe Casino and Thursday night at People’s Court in Des Moines.